Every toolbox needs a badge! I recently started a metalworking course. This required a new toolbox. Everything with me it seems, requires a new toolbox. That aside, I needed a way to identify my plain black steel toolbox against the myriad of other plain black steel toolboxes in the world. With brass, copper, and nickel silver sheet at my disposal, this is what came out. You might call it toolbox jewelry. I plan to set up a forge this summer and this may be my logo. I am thinking ‘Holy Hammer Forge’ for the name. What do you think? 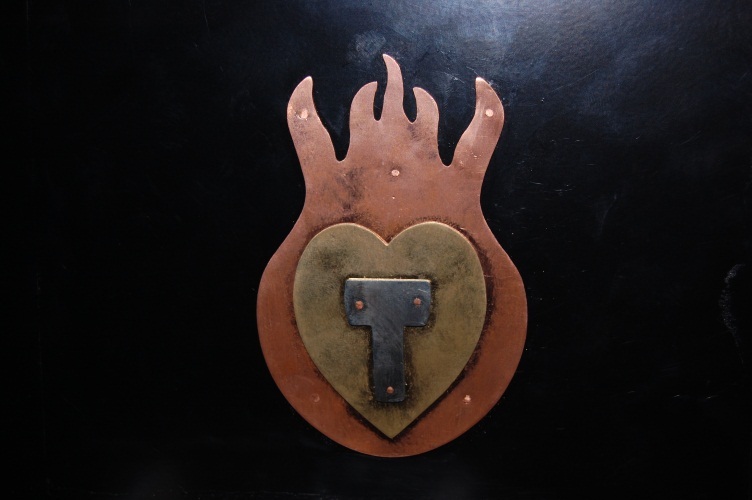 This entry was posted on June 25, 2010 at 3:44 am and is filed under Blacksmithing, jewelry, metalwork. You can follow any responses to this entry through the RSS 2.0 feed. You can leave a response, or trackback from your own site.